The third round of the GMBC Championship for SeaWinds will take place at Emmarentia Dam on Sunday 17 March. The long-range weather forecast is for a hot, partly-cloudy day with temps reaching 31 and winds in the 5 to 10 kn range. Come and enjoy a late summer's day sailing in a fun and friendly atmosphere. There will be tune-up races from 10h30 and the regatta will start at 11h00. See championship results here. Get more information here. Download a copy of the Regulations here. Welcome to the sail boat racing group at the Gauteng Model Boat Club. 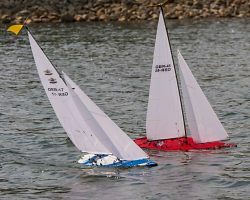 Model yacht racing can get just as competitive as the full-size boats and operates under the same rules and procedures. The more experienced sailors are always willing to share their experience to help beginners to tune and race their boats competitively. For more information please come along and join in the fun and games and meet the guys and girls. They will gladly show you how to sail an RC yacht and may even let you take the controls to see what it feels like to make the boat speed across the water in the intended direction using nothing but the wind for power, while avoiding obstacles and other boats, and hopefully placing your boat ahead of the fleet! At GMBC we run a championship for RC yachts. We standardise on the SeaWind one-meter class so that all the boats are the same and a skipper has to try harder to beat the others who all have equipment of equal performance. Unfortunately championship regattas are only open to paid-up members of GMBC sailing SeaWinds, but visitors and other boats are welcome at any other time. See championship results here. At GMBC the accent is on having fun and although we love racing our RC sailboats, it's more important to participate than to win. Having said that, there are some basic rules we should apply to avoid collisions and conflicts on the water. The basic rules of yacht racing. For a more comprehensive discussion of RC yacht racing rules, go here. In yacht racing, starts are the busiest time of any race because you are concentrating on avoiding many other boats squeezed into a small area. You are trying not to infringe any rules, making sure you don't cross the line early, and trying to get the start time spot on. In big boats it is easier because the committee boat is usually right there on the start line, but in RC, where each skipper is watching his boat and those around him from some distance away, there is no opportunity to also be looking away at coloured shapes and start signals on the shore. Instead we use sound signals so that we can listen to the start sequence while watching and sailing our boats. See a video here of a SeaWind sailing on Emmarentia Dam. © All images on this site are copyrighted by their respective authors who retain their intellectual property rights in full. You are not permitted to copy, store, publish or use in any manner, for any purpose whatsoever, via any medium, any picture displayed on this web site.